Properties in Museo Franz Mayer average 4.3 out of 5 stars. Property 8: Best located Suite!! Property 13: Soak up a lovely stay!!!! Property 15: Amazing full house very spacious and well located within Nuevo Polanco. Property 19: House in Lindavista with Excellent Location! Property 20: House in Lindavista with Excellent Location! Property 24: Casita Narvarte! Traditional Mexican charm amidst Urban Mexico City life. Property 33: Beautiful House In The Heart Of The Most Trendy Area Of The City. 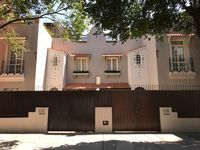 Property 37: Amazing in Polanco ! Property 40: Beautiful & Spacious. Large Balcony. Top Location. We have rented homes around the world and this is a very unique property with very friendly staff. We highly recommend it.